Drywall must be finished properly so it can provide an elegant look. 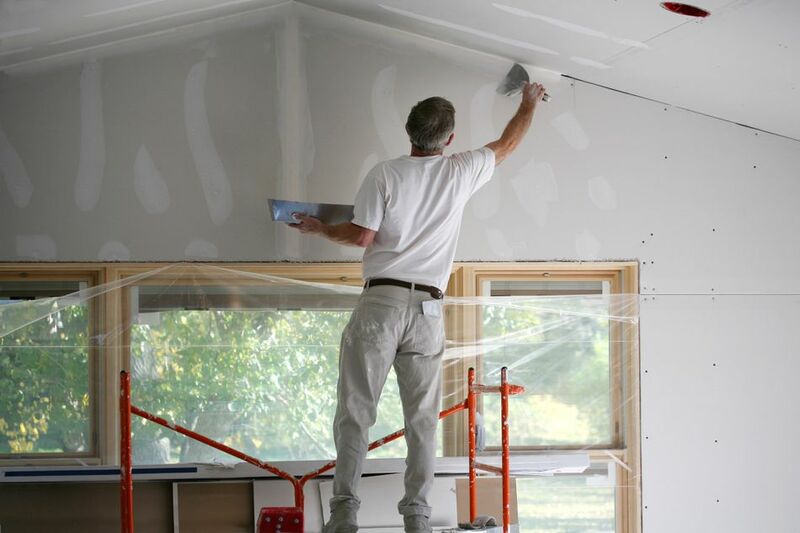 However, there are several problems that you might face when finishing drywall. Let’s take a look at some common problems and how to solve them. It happens when the initial mix contains too much water. To avoid this start by mixing with small amounts of water and keep adding water until you can see there are no more lumps in the drywall texture. Mix thoroughly and use the right mixer to do this work. Remember it is better to add water than to add mix that you will need to discard later. Remember it is better to add water than to add mix that you will need to discard later. If your drywall texture mix is too thin, it is usually because you are using cold water. If you need to use cold water, allow the material to soak for at least two hours before mixing it. It is not recommended to use materials in temperatures under 55 degrees Fahrenheit. Remember once again to use the right amount of water, probably a little less than specified by the manufacturer. If you are applying a spray on texture, be sure to follow the manufacturer’s recommendation on air pressure. If you hold the gun too close to the surface being sprayed by the texture, this will make the application to bounce or fallout of aggregate. In other words, the texture will not adhere to the wall surface. Also when using spray-on texture, be sure to add enough water to bring texture material to the right viscosity limits. Do not move the sprayer too fast or too slowly. You will need to determine what will be the best speed to use when applying the spray-on texture. Do not overload the spray surface and remember to use the right spray pressure. The speed of application must remain constant over the wall or surface that it is being finished. A common problem happens when there is insufficient water in the spray mix. It can also occur when the material was not estimated properly, and you are trying to cover more than the recommended coverage area. You can avoid this by using the right spray pressure and by applying the joint in a uniform way. Follow the manufacturer's recommendation in regards to coverage area. When the material is being used to cover large areas, more than the manufacturer’s recommendation, the joint layer will be so thin that will not cover the contrast between joint and gypsum panel paper. Remember that your surface needs to be primed properly to avoid this problem. To eliminate this problem, use the right amount of water when mixing and apply the joint using the same speed. You can also prepare your surface by applying a prime coat or undiluted interior flat latex paint with high solids content. Joint darkening occurs when the mix is applied over a damp joint compound in cold or humid conditions. Before applying, allow the texture to dry completely and paint the entire surface. Before you start texturing, apply a prime coat or flat latex paint. If necessary being heaters to the room, wait until the temperature is appropriate or find mechanical tools that allow you to remove the moisture from the room. Texture Buildup can occur over a drywall joint when the surface has not been properly prime. Do not allow too much time between roller or brush and texture applications. Over-dilution of texture material will produce texture buildup over the drywall joints. Use the correct amount of water when mixing texture material and allow enough time between application and final texturing. Flashing Over Gypsum Panels can cause a texture variation which often appears as a color contrast. Allow texture to dry and paint entire surface. Prepare the surface before texturing using a prime coat or interior latex flat paint. Remember to apply the products at the recommended temperature to avoid other problems.